As an undergraduate I never had the beard for the mad scientist look, but I did manage to cultivate this image in other ways. In particular anyone who came to my flat would be bombarded with walls covered from floor to ceiling in mind maps. I discovered mind maps while at school when trying to find efficient ways to revise, finding that pouring through notes was less than ideal. Mind maps clicked with me straight away and I've used them ever since. Mind maps are ideal for anyone who doesn't think in a completely linear way, which I imagine is almost everyone. Rather than writing out notes starting at the top of a page, working down and then going onto the next sheet, you start in the middle of a page (preferably of A1 paper) and work outwards, using arrows to link ideas, as much colour as possible and plenty of pictures. The result is a personal image of a topic, essentially what is in your mind put onto paper. I always found that once an idea was in mind map form I could then recall the conceptual links and image how everything fitted together much much better than I ever could with pages of paper. This worked for me just as well for equations as for essay subjects, if not more so. I could combine all the equations in any subject in the appropriate ways with links, hints for getting from one place to another and more often than not, see links which we had not been told about. I'd always wondered if there was any way of doing this efficiently on a computer, and with a little searching on my new laptop this weekend I found just the thing. 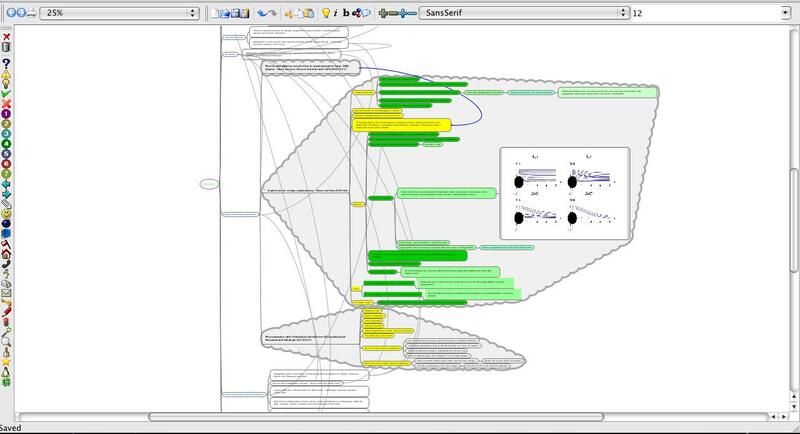 Freemind is a free piece of mindmapping software which allows me to do almost everything I could do on paper, plus many more things beside! Click on the image for the version in flickr. NB. the links in the above diagram can be moved around to make it look much neater than it currently is. The nodes can also be opened and closed when you want to look at a particular section in more detail than another. I started with the name of the topic in the centre of the screen and off this centre came the subtopics. From each of these subtopics I wrote titles, authors and hep-th numbers of the papers which I've been reading which have been written on this topic. The papers and their content are what are seen in the bubbles above. One of the best things is that because I can put a link to the papers embedded into the mindmap, I can simply click on the title of a paper and it opens up. No need to carefully label all files and store them in a number of subfolders - I can now organise them visually - I've been looking for a way to do this for a long long time! So, once I've got the paper title in, I can give a sub-mindmap of the details in that paper - I can give a few bubbles with the main points of the paper, a few details of the method and the results, plus any obvious extensions which need working on. I can link to any mathematica files I've written for any part of the paper and I can embed pictures directly into the mindmap. Currently it's not possible to use LaTeX which is a pain but because I can easily export LaTeX to a png file I can embed this whenever it's needed. There are plenty of people in the forums for FreeMind asking for LaTeX or MathML inclusion, s it may be there before too long. Mindmaps are not that great. Think about all the time you waste trying to mindmap when you could be doing something else. I think mindmaping is the single greatest tool for 21st century marketing.